In today’s conversation, I’m thrilled to speak with my friend – and the best-dressed person I know – Pellegrino Castronovo, the owner of Pellegrino Castronovo Fitted Tailoring. I first met Pellegrino at Jayson Gaignard’s Mastermind Talks out in Carmel, California, (so special thanks to Jayson for assembling the incredible group of people he does each year at his event). 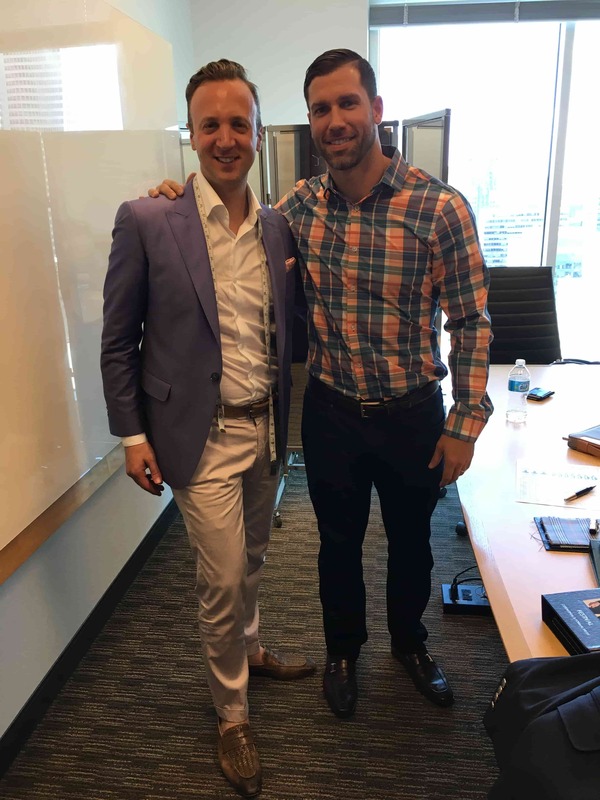 Then I had the opportunity to experience Pellegrino’s custom fitting first hand when I visited Montreal last summer with my family and I knew there was so much he could share when it came to creating an incredible client experience and how your image can impact your business, either good or bad. Getting fitted suits from Pellegrino quickly taught me something… He pays more attention to the smallest details of the customer experience than anyone else I know. He understands how to build trust, connect with people in an authentic way, and deliver a true luxury experience in every sense of the word, something that obviously relates to your job as a financial advisor. Pellegrino has fitted professional athletes in the NFL, NBA, NHL, and MLB, many of the top brass in Formula 1 racing, Sugar Ray Leonard himself, and many other notable celebrities. So he definitely knows a thing or two when it comes to catering to high net worth individuals and how your fashion sense can impact your clientele. Today, we discuss fashion tips for financial advisors. We get into the brilliant, yet simple things that you can do to market yourself and stand out in a “sea of sameness”. As financial advisors, we can learn a lot from Pellegrino’s processes and insights. Also if you’re listening to this podcast, I highly recommend checking out the show notes or visiting our YouTube channel to watch this episode on video so you can see Pellegrino’s custom work and a visual example of how he made even his “business card” experience a unique one. [07:44] Pellegrino reveals how he can tell a successful financial advisor apart from an unsuccessful one, before they ever open their mouths – and how the way you dress impacts how your clients and prospects perceive you. 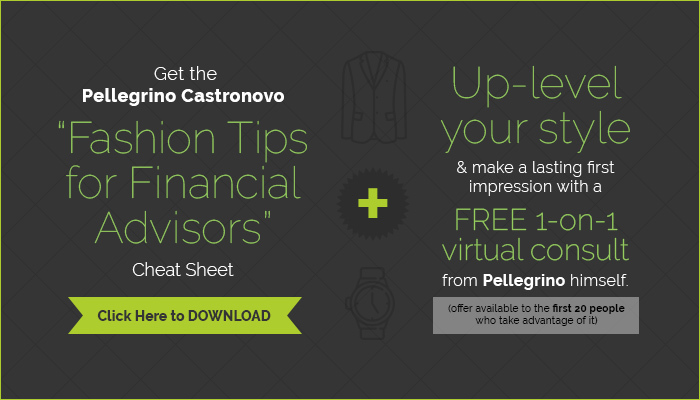 [28:12] How visiting other tailors helped Pellegrino better understand, improve, and develop his customer experience – and why he believes every advisor should go engage with at least three other financial advisors if they want to play at the highest level possible. [41:13 How clothes gives us confidence – and the story of the time I put on a suit for the biggest recruiting call of my life, even though no one else was going to see me wearing it. [42:48] The 3 clues to look for when hiring a custom tailor in your market that can give away whether or not they are a true master of their craft. [01:04:18] How Pellegrino found his own financial advisor – and the #1 thing he looked for when making his decision. He shares his internal dialogue and the psychology of your prospects when sitting across the desk from you. HINT: If you’re trying to copy what the “other guys” are doing, you’re doing it wrong! Pellegrino reveals the link that’s often missing for most financial advisors – and I promise, it’s something you can implement immediately! [08:00] How renting a Lamborghini and dressing better than everyone else in the field helped someone break into a totally saturated market. [09:17] Why people are always looking for telltale signs – and how they create confidence, make people think you’re legitimate, and build trust. [12:21] The reasons customer experience – and how you dress – matters. [13:23] Why dressing well lets people know you’re doing something right. [14:21] The reasons a high level of trust is required in both tailoring and financial advising. [15:11] Why I call Pellegrino the Suit Whisperer – and how Pellegrino uses his gifts to highlight specific qualities in a person as he dresses them. [16:24] Pellegrino’s thought process as he fits someone – and why he’s always looking for the disconnect between what someone’s saying and their body language. [17:21] How Pellegrino first perceived and read me when we met. [20:57] The key wardrobe details financial advisors should steer clear from. [22:60] Why people perceive sloppy dressers as sloppy in the rest of their lives as well. [24:16] Why financial advisors can learn from my experience getting fitted by Pellegrino – and what you absolutely cannot miss when building trust in a new business relationship. [29:00] A simple and absolutely brilliant marketing idea I learned from Pellegrino’s jackets. [34:58] The reasons clothes give us a heightened sense of confidence. [49:05] The surprising story behind Pellegrino’s striking jacket linings. [51:20] The one thing everyone needs to experience on a trip to Italy. [54:54] The first person who comes to mind when Pellegrino thinks of success. [56:01] Why Pellegrino would like driving to be thought of as absurd in 25 years – and why I agree. [58:49] The reasons Pellegrino is fascinated by art that triggers negative emotions inside of him, and how it reaffirms the fact that we rely on stories to connect with others. [01:02:48] Why giving people what he wants has been so key to Pellegrino’s success. [01:04:18] How Pellegrino found his own financial advisor – and why he always looks for stories, even in worlds where coldness is sometimes equated with professionalism. Thanks for checking out the latest show! I really appreciate the couple of minutes you all have taken to share your thoughts as the reviews help our show get found and rank on iTunes! Also special thanks to those of you who left a review since our last show as we are now in the triple digits with 106 reviews – THANK YOU, THANK YOU, THANK YOU! Thanks for the review and I love that you found the podcast early on in your career as it’s my goal to condense years worth of knowledge into each episode by bringing some incredible guests on and asking them questions I know financial advisors are wondering about based on my decade plus of conversations with them. I was trading LinkedIn messages with a college student who reached out to me the other day saying thanks for the mentorship and it really hit home to me that with today’s technology, there really is no barrier to seeking out wisdom, it’s about who makes the time to go out and get it, so well done on your end, keep it up and the extra effort will pay huge dividend in your practice, that’s a promise! Thorn, thanks for the kind words and was great to connect with you in person as well, so thanks for reaching out and applying to have a chat! 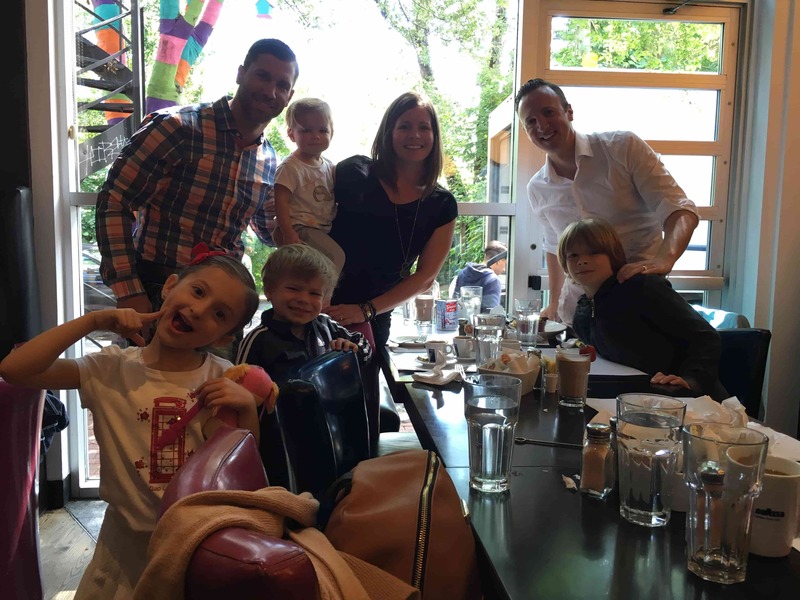 Also I love the fact that you are not just focusing on the business side, but running with the family board meetings that Jim Sheils shared a few episodes back, it’s been the #1 most powerful thing I’ve done as a dad to connect with each of my children in a way that’s completely unique to them so well done! For those of you wanting to connect 1 on 1 like Thorn did for coaching or maybe you are interested in attending one of our events at AE Headquarters – you can apply in under 5 minutes at www.bradleyjohnson.com/apply. First off, phillipmills, I want to thank you for serving our country as without you and others like you, none of us would be able to do what we do. If you happen to be listening to this, please reach out personally as well as one of my good friends Phil Randazzo happens to run a nonprofit named American Dream U whose sole purpose is to help veterans transition from serving to getting back in the work force and he’s partnered with Advisors Excel to get more veterans into financial services, so if you need any help with the transition, we are here for you. Secondarily, thanks so much for the kind words and review, means a lot to me personally that the podcast is helping you make the transition to financial services and will do my very best to keep putting out content that can serve others like you! Thanks for the review and for listening in David! Also thanks for trusting us and making the transition to being part of the Advisors Excel family of advisors across the nation, we are glad to have you on the team and helping you grow your practice in a way that serves your clients up there in Omaha. As they say, better late than never right!?! Look forward to meeting you in person at an upcoming event and please let me know if any other guests you can think of who would deliver for you all on the show! As a quick aside, if audio quality is a little off on this intro, it’s because I’m currently recording from a hotel room in Kansas City as we’re waiting for my oldest son’s Sunday baseball games to get kicked off. And I’ve got a special guest here, my oldest son, Braun. Braun, can you say hi to the financial advisors out there? [00:00:57] Brad: Braun, do you have any advice or anything you want to share with everybody listening in out there? [00:01:01] Braun: Not that much. I just want to give a big thanks to say how much subscribes you gave to my dad. [00:01:08] Brad: Awesome. Should they give him some more subscribes too? [00:01:11] Brad: Should they go review the podcast? [00:01:14] Braun: I don’t know. [00:01:17] Brad: Yes? Okay. So, you heard it there for my eight-year-old. Thank you for the subscribes and you should definitely go out and leave a review. So, in today’s conversation, I’m thrilled to speak with my friend and the best-dressed person I know, Pellegrino Castronovo. He’s the owner of Pellegrino Castronovo Fitted Tailoring. I first met Pellegrino at Jayson Gaignard’s MastermindTalks out in Carmel, California. So, special thanks to Jayson for assembling the incredible group of people he does at each year at this event. Then I actually have the opportunity to experience Pellegrino’s custom fitting firsthand when I visited Montréal last summer with my family. And after that, I knew there was so much he could share when it came to creating an incredible client experience and how your image can impact your business either good or bad. Getting fitted suits from Pellegrino quickly taught me something. He pays more attention to the smallest details of the customer experience than anyone else I know. He understands how to build trust, connect with people in an authentic way, and deliver a true luxury experience in every sense of the word, something that obviously relates to your job as a financial advisor. Pellegrino has fitted professional athletes in the NFL, NBA, NHL and MLB, many of the top brass in Formula 1 racing, Sugar Ray Leonard himself, and many other notable celebrities so he definitely knows a thing or two when it comes to catering to high net worth individuals and how your fashion sense can impact your clientele. Today, we discuss fashion tips for financial advisors. We get into the brilliant yet simple things that you can do to market yourself and stand out in the sea of sameness. As financial advisors, we can learn a lot from Pellegrino’s processes and insights. Also, if you’re listening to this podcast, I highly recommend checking out the show notes or visiting our YouTube channel to watch this episode on video, so you can see Pellegrino’s custom work and a visual example of how he made even his business card experience a unique one. [00:03:16] Brad: Here are just a handful of the things we discussed. First, Pellegrino reveals how he can tell a successful financial advisor apart from an unsuccessful one before they even open their mouths and how the way you dress impacts how your clients and prospects perceive you. Next, Pellegrino shares how visiting other tailors helped him better understand, improve, and develop his customer experience. The same process can be applied by financial advisors. In fact, Pellegrino believes every advisor should go engage with at least three other financial advisors if they want to play at the highest level possible. From there, Pellegrino and I talk about how clothes give us confidence and I share a story of the time I put on a suit for the biggest recruiting call of my life even though no one else was going to see me wearing it. 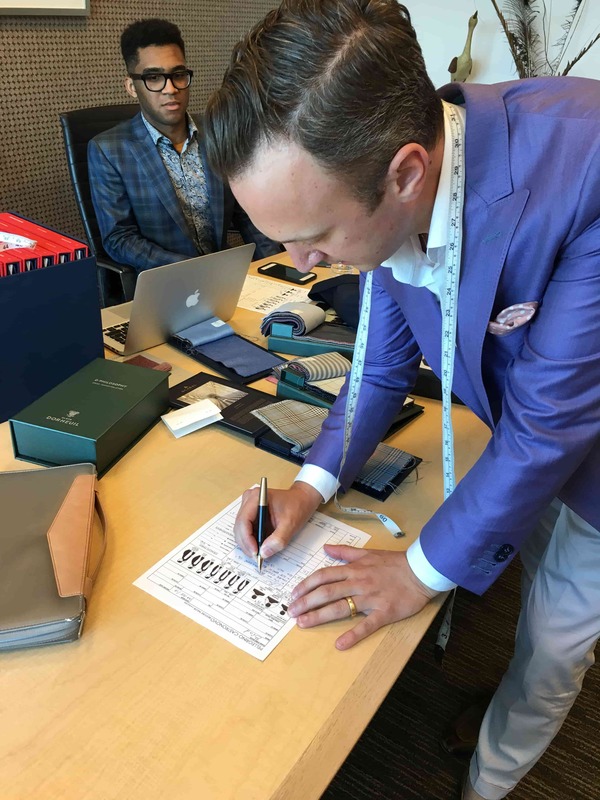 Then we cover the three clues to look for when hiring a custom tailor in your market that can give away whether or not they are true master of their craft. Definitely, some insider info here are as I wouldn’t have had a clue before these tips from Pellegrino. Finally, and I might add that Pellegrino saved the best for last during this conversation. We dig into how Pellegrino found his own financial advisor and the number one thing he looked for when making his decision. He shares his internal dialogue and the psychology of your prospects when they’re sitting across the desk from you. Hint, by the way, if you’re trying to copy what the other guys are doing, you’re doing it wrong. Pellegrino reveals the link that’s often missing for most financial advisors and I promise it’s something you can implement immediately. Okay. Before we get to the show, Pellegrino, as I found that he does, has prepared something over-the-top for you Blueprint listeners that I know you’re going to appreciate. Not only is he sharing his free downloadable fashion tips for financial advisor’s cheat sheet but for the first 20 of you who take advantage of it, he’s offering a 20-minute one-on-one virtual consultation to help you level up your style, so you can make your first impression a lasting one. [00:05:12] Brad: You can get your download and apply for the consult at BradleyJohnson.com/47. That’s 47. As always, show notes that include links to all the resources, books mentioned, and people discussed are available there as well. So that’s it. As always, thanks for listening and without further delay, my conversation with Pellegrino Castronovo. [00:05:36] Brad: Welcome to the Elite Advisor Blueprint and I’ve got to welcome my friend and the best-dressed man that I know, Pellegrino Castronovo. Welcome to the show, my friend. [00:05:46] Pellegrino: Oh, my goodness. I’m so humbled by that intro. Hello. Ciao, everybody. [00:05:50] Brad: Well, I already know just from the pre-conversation before we even went live here, this is going to be one of my favorites and just from hanging out, we always have a good time. So, I’m good with just diving right in unless there’s anything you want to throw out at the front-end? [00:06:04] Pellegrino: No. Just hello to everybody around the world. That’s it. [00:06:07] Brad: All right. Well, let’s do it. So, as you know, obviously I work with financial advisors, Pellegrino, and one of these things that’s been this age-old debate in over a decade that I’ve been doing this is there’s one school of thought that says, “I can’t dress too nice because my clients will think I make too much money and do too well.” And then there’s the other school of thought that says, “I have to dress nicely so that my clients know I do well and that I’m a professional and a master of my craft and I take this seriously.” So, please weigh in with your thoughts and the psychology behind how you carry yourself, how your dress, and what that portrays about you. [00:06:46] Pellegrino: Okay. It’ll be my pleasure to lay the ground on this. Okay. This has been one of the biggest debates I’m doing for 20 years and the conversations I had with many tailors. So, the first is false. People feel if they look a certain way, it will make the impression on their client that they’re making too much money and they’ll feel that the client will pull away from this. This is not true. A lot of group of people have had a bad experience or somebody said something, “Oh, you’re making a lot of money. Are you doing so well?” And what they end up doing they classify everybody like that and they look at that as a factor, a statement to base this whole theory on. From all my experience, let me tell you a story first, I sell to a lot of financial advisors and I could tell the successful ones from the not just based on certain details they do in their life and they portray. So, it comes from a story where this man came to my shop over 15 years ago and he wanted to get into the fruit industry, so he wanted to sell fruits to this fruit market that was saturated already, and he wanted to enter it and there’s a lot of mafias, there’s a lot of like connections, old school of connections. So, what he did was he rented a Lamborghini. He owes his money to rent this Lamborghini and he drove it into the market and he kept on driving around this market, getting out, looking at his phone, talking to a person here and there all around this market and people started asking, “Who is this guy? Who is this guy?” They started inquiring. He started giving his card. He started networking, talking a bit, and the image to all these farmers that this person here must have a product that everybody wants for him to be making pennies off of, for him to be this successful. [00:08:47] Pellegrino: So, that subconscious saying, “Who is this guy with the Lamborghini?” But I’ll tell you nobody rents a Lamborghini, but it worked for this kind of story where people feel I don’t want to be the first one to invest into a product that could go wrong. I don’t want to be the first one. So, they’re looking for telltale signs. When they’re looking at you, they’re looking for these telltale signs constantly. They look at is he successful? Did other people invest in him? Is he making money for other people? And how do they do that? By what you say? No. It’s not about what you say. And all in contrary a lot of the salespeople you know that say everything that they want, and the thing is we want to be honest so if we’re already successful, we say it. If we’re not yet or we’re growing in a growing phase, don’t say you’re successful at this point. Don’t say you have made it. Don’t say you’re living a certain lifestyle. People will catch that right away. So, it’s first analyze your position in life if you’re a start off or if you’re successful. And if you are successful, you have to by telling these telltale signs, it will create confidence in the other person and the person is analyzing and saying, “Okay. This is the legit person who’s doing very well, very successful,” and it builds trust. It builds confidence in the person’s ability to you there make the money, sell them a product, or interact or at least good to the next level. So, yes. We’re going to look for these telltale signs. What are the telltale signs? It’s going to be little things and I really don’t like to mention it, but I want to verbal it, verbal out and you choose what you want to do with this information but they’re going to look at the keychain. They’re going to look at the garments you’re wearing. They’re going to look at your watch. They’re going to look at all these signs where they have proof, direct access to what’s in your bank account or if you’re successful enough. They’re going to look for that right away. [00:10:51] Pellegrino: They’re going to say, “Okay. Is he coming in with a broken-down car? Is he coming in with a garment that is on threading or it’s cheap or is his whole outfit and car less than what I’m going to be giving him?” How can I trust him with all these? Is he going to just run away with everything? I’ve got these feelings from also like my financial advisors. So, when you show up that you don’t need their finances, when you show up with this is my status, this is my level, it automatically creates confidence. They may not like you or they may not want to be your friend because they feel like you’re up here and you think they’re better, but they definitely do have confidence in dealing with you in business. Exactly after that, I go to the second CPA, greeted by a receptionist, beautiful little area where the conference room table, TV, drink, refrigerator right behind. I have no idea who had more tax knowledge. I just I know I bought and I moved my account to the second one because all of those signs were telling me this office is more successful and more legitimate. I think a lot of what you’re saying applies to how you carry yourself, how you dress. Would you say that’s fair? [00:12:59] Pellegrino: Yeah. Dressing is one segment of that and it says a lot about yourself. There are all different levels. By just to go back to that point what you said, it never makes a person feel he’s making too much money, I won’t do business with him. It never makes them feel that. In contrary, it makes a person feel they must be doing something right. They have a good product that everybody is buying. It’s a Walmart like their prices are just perfect and they’re doing, they’re expanding, they’re big because they have something right and that’s what a person feels. That’s what a person has in their mind. And so, anyway, that’s a whole another segment but when you’re fitting very successful people that deal with people that have money and need to look very nicely, let’s go into the psychology because we were literally out in Carmel at Jayson Gaignard’s MastermindTalks. That’s where we crossed paths and I’m just going to call you like the suit whisperer because I know of no better term and we’re sitting there. I think we’re sharing, you’ve got a beer, I’ve got a beer, we’re just talking, “Hey, what do you do? What do I do?” And pretty much within about two, three, four minutes conversation, you’re like, “Let me tell you how I think you should…” Kind of like, “Here’s how I think you’re probably portrayed as a business person. Here’s that type of suit, here’s the kind of what I would recommend or where I see you really pulling that part of your personality out.” So, can you speak to how you deconstructed that so quickly and kind of your thought process as you tailor different types of people? [00:15:36] Pellegrino: Okay. So, it has to start with also my background and my knowledge so when I’m dealing with a client or individuals, I stop thinking of myself and actually that’s why I had to put this paper in front of my podcast, so I don’t look at myself. I’m fully engaged in how the other person is making me feel. So, I picked this up over the years. It’s 20 years of tailoring, one-on-one with men and constantly I’m checking my feelings, my sensories, my radar to see what type of person I’m dealing with or I’m talking to, I’m speaking to. What he’s saying doesn’t match his energy or the details he’s doing because if it doesn’t, there’s a disconnect and I got to figure out what’s that disconnect. If it does match, then could we highlight it? Could we make it seem, could we make the strength seem more? So, I think we went sailing together and right after that sail, we stopped at a little I think it was like a bar or a bistro. [00:16:43] Brad: Yeah. Little hole in the wall. [00:16:44] Pellegrino: Yeah. You had a beer. I had a [inaudible] and I just started speaking to you and I felt a very trustworthy factor about you. I felt that instantly and I felt very strong trustworthy factor. I didn’t feel this person would run away with any of my finances. I didn’t feel you to be pretentious. I didn’t feel you could be a show-off. I thought you very genuine just like a loving friend like if I was next to you, we’d be good friends and we would hang out without intros and without bells and whistles. And I felt that interesting because it’s an interesting quality that a lot of people shy away from and you were very comfortable with it, you are very comfortable in who you are in that setting. So, what I wanted to do is to highlight that because it’s a beautiful quality that not many people have. And that’s why I suggested right away I said, “Look, you have a trustworthy factor. You have a capability to project trust into other people. It’s just a natural thing.” And everybody has different strengths, also different weaknesses. So, I like to just highlight people’s strengths. It’s an easier way to connect with other people. So, certain garments, certain colors, certain shades to highlight that trustworthy factor or to highlight that character that you’re already having within that builds confidence, that builds like a character that you’re not running away or you’re not just going to leave the next day. That friend that will be there for the next 20 years. That’s what I felt and that’s what I highlight. But everyone, everybody has their highlight and some people have, for example, let’s say a guy comes into the room, he’s a bodybuilder, black hair, dark eyes and his facial expression, natural facial expression is a facial expression that doesn’t smile. He’s like this. If a person has a mask on his face, no matter what is being said, no matter what they’re talking about, the only thing you’re thinking about is what’s behind that mask. No matter how poetically perfect his vocabulary is or the way he speaks, the only thing he’s thinking is, “I wonder what he looks behind that mask.” Regardless if I like him or not, I just want to know, and people get that sense. When people are looking at somebody, you’re always wondering, “Is this person real what he’s saying? And what’s behind them?” Like if it’s not, I feel like that he’s hiding something, or I feel like just something he’s ashamed of maybe. All right. Maybe he’s ashamed that he’s not at a financial level that he wants to be, or he doesn’t have a portfolio like his neighbor. He has that fear and he projects that. So, we have to build confidences somewhere else, so he doesn’t feel that fear when he’s meeting somebody. [00:20:41] Brad: Okay. So, let’s dive in a little deeper there. If you’re a financial advisor, what are wardrobe things you would stir clear of like, “Oh please don’t do this?” Give me some examples there. [00:20:53] Pellegrino: Okay. So, wardrobe details that you would stay away from is imagine yourself in a black-and-white movie. If you wear a dark-colored shirt and you have a dark shirt and suit, so in a black-and-white movie that will basically be like you’re wearing a dark gray outfit. So, what you want to do is create contrast levels so dark on dark next to your skin, you want to stay away from that. It’s portraying too many movies as gangster. It’s portraying too many movies as the bad guy. Subconsciously and psychologically people have that in the back of their mind. No matter how good you look with it. You look fantastic, but I’ve seen a lot of people like to go that dark on dark or just a medium gray with a black shirt or dark shirt. [00:21:40] Brad: Don’t forget the pinstripes. Those are common in our industry too. [00:21:44] Pellegrino: Oh, is that right? [00:21:44] Brad: If you want to go extra gangster. [00:21:49] Pellegrino: Pinstripes actually is coming in the industry. It’s coming back in fashion. [00:21:53] Brad: Hey, that’s a thing. If you hold on to the suit long enough eventually it will be back. [00:21:58] Pellegrino: Yes. Like, if you picked up a reputation of not being in style for the past eight years. So, you would want to look at also the length of the sleeve and the length of the pants. This is also too long, it becomes sloppy and people feel you’re wearing a sloppy garment and too long of a pants like it’s too many breaks at the bottom, it’s sloppy. So, just to give you like a heads up, so this line right over here, if you bend your wrist going towards you, you will see a line that appears, the first line. When your arms are to the side, your suit jacket has to fall at that line. This shirt half an inch after that. Why? Because a lot of men wear it to their knuckles sometimes and when they’re talking or they’re speaking it becomes sloppy. Sloppy means they don’t care about the details. If they don’t care about the details, will they care about the details of your portfolio? It’s simple. So, the more you care about the details, the more they think, you’re looking at the details of their money. You’re looking at the details of their portfolio or the business or whatever you’re selling. So, more details you could display, more details and more proof you’re giving the clients or reassurance you’re giving the client. The more you talk without those details, “Oh I’m a detailed person, I’m a very detailed person. I went to this university and that, this and that,” it doesn’t matter if details are not matching what you’re saying. They’re questioning what’s behind that. [00:23:30] Brad: So, speaking of details, we’ve got to go here because your attention to detail and for those of you that are listening via audio, by the way, you’re missing out on at least one of the best-dressed guys I’ve ever seen. So, Pellegrino’s got an exquisite jacket on and I had to throw one that he did for me on as well. So, definitely make sure you tune in to the show notes or go check it out on YouTube, the interview. So, we’re introduced at MastermindTalks and I’m like, “Hey, crazy coincidence. I’m going to be in Montreal this summer which is where you’re based out of,” and you’re like, “Swing by.” And so, perfect I wear a lot of suits for work or jackets and things like that. So, I swing by. I’m just going to kind of paint this picture because there’s so much financial advisors can take from the client experience that I experienced with you that I think going back to attention to detail, there was so much. So, first off, be like, okay, well, I’m there with my whole family so my wife, our three children so three and seven years old, be like, “I’ll join you for breakfast.” We’ll meet at these spots in all of Montreal which I’m going to butcher the name, L’Avenue. Am I saying that right? [00:24:40] Brad: Okay. Yeah. You can say it much better than I can. So, anyway, we get there and you’re like, “Well, let me know when you’re getting in because it’s really, really busy,” and it’s like the spot. And so, you literally have your assistant standing in line on our behalf and by the time we get there, I roll up in an Uber, my whole family piles out and the line is like 15 deep behind your assistant and I’m feeling like so bad because this whole crew just rolls in. You had literally taken care of that detail, so we show up, we walk right in without to wait. Side note, the coolest bathroom I’ve seen in the history of any restaurant for those of you listening in if you get a chance to check it out. So, let’s just take this all the way through. We have a great time. I show up. You have an office and actually a very close to my office building where we do a private fitting. You show up with everything. I just walk in. You’ve got all the materials, shoes, belts, all of that. Pick out three or four garments. I’ve bought some nice suits over the years. I’ve never had this happen. So, you’re like, “I will ship you…” what do you even call it? Like a practice suit? [00:25:43] Pellegrino: A sample suit. [00:25:45] Brad: Okay. So, we get all fitted up and then, I don’t know, probably a few weeks after, a sample suit shows up so it’s not even a real suit. Any of the materials you’re like, “Yeah. Just want to make sure this fit properly.” I get a text, “Hey, it should be showing up that morning.” It was either from you or your assistant. So, like all the way through this whole process, I’m getting checked in on so text along the way. I get the sample suit. You say, “Hey, when would be a good time?” And so, we set a time. We Facetimed where I throw this thing on and you’re like, “Hey, side view, front view. We need to move that. Okay.” And like probably 15 minutes you send me another sample suit because you’re like, “That one was just too far off.” So, we do that a second time and then by the third time we’ve got it dialed in and then everything starts showing up and the whole way through your communication back and forth was little text check-ins like, “Hey, the materials came in, they look beautiful, we’re working the suit.” Your assistants pinging me a couple of times like, “Hey, the FedEx package has gone out.” And so, really big build up here but I think there are so many lessons that can be taken away from the whole experience all the way through. And so, I just want to ask you, I know a lot of that’s obviously very intentional, how did you craft this client experience? What are the key things that you find along the way that are things that you can’t miss to build that trust in the relationship? [00:27:12] Pellegrino: Yeah. Well, thank you. You saw all the details. [00:27:16] Brad: Hey, I notice them. [00:27:17] Pellegrino: That’s amazing. First, it has to be being a purchaser myself walking through situations and I’m like, “Oh, I don’t feel I’m valued here.” I don’t feel like I’m dropping a lot purchasing that or this. What is luxury, right? Luxury is the details that make a story perfect and having that not reciprocated to me made me question and made me want to be that way to others. So, for instance, very in tuned to how I’m feeling when I’m purchasing or buying or dealing with anybody and then after I transform that and said, “You know what, I would like to know what’s happening along my order.” So, my knowledge, I also get a lot of garments made for myself from Italy trying out different tailors over there and patterns, and I learn a lot. Like, actually, I believe every financial advisor should hire three other financial advisors to and they should put up a bit of money there and see how their experience putting their money through other financial advisors. For me, I had to experience how others are along the process and it’s very scary because it takes about a month to get the first garment going, the fabrics in, and you’re like, “Did he forget about me? What happened to my garments? Am I just a number?” All these like feelings are coming back. So, none of them ever text me or send me a message or an email saying, “Hey, we’re in the process. We just got your fabric or we’re cutting right now.” So, I wanted to reciprocate that feeling reassurance to everyone. And I put steps along the way just to make sure everything is perfect. So, it’s more slightly how I would like to be treated and I’m very in tuned in how I would like to be treated. That gives me the ideas of how to treat others really, I’m positively thinking. [00:29:12] Brad: I left one of the coolest things out which is the simplest coolest marketing idea ever. So, once again I’m pushing you all to watch the YouTube video here because a lot of this is very cool in this episode. So, I’m going to stand up now and I’m showing off a Pellegrino suit jacket here which can you tell them the story of the interior and the thought process and how you pulled that off? [00:29:32] Pellegrino: Yeah. Sounds good. [00:29:33] Brad: We’ll get to that, but I have to show this so I’m putting this on camera. So, I think it was three or four jackets and I just put the jacket on and I go to wear it and then I feel something on my side kind of on my hip and I reach into the interior pocket of the jacket and there’s a business card and not just any business card. I swear it’s like it’s some form of leather. It’s like a suede leather and I know these aren’t cheap Pellegrino but then it’s got this little band wrapped around it. I’m going to hold it up to the camera. “Be the guy who knows a guy.” And I look at this thing and I’m like, “How simple but brilliant,” because everything you do is so high end from the front end picking out the materials, where they come from, how you source them. You have a story behind everything and where it originated and why you chose it and it makes you want to, as your customer, tell other people the story and then you’re like, “Yeah.” You tell a story and then you’re like, “Oh yeah, I know a guy.” I mean, that’s like a – so how did you come up with that idea? [00:30:38] Pellegrino: Okay. First of all, the cards, the business cards, the paper is brought in from Italy because I have a pet peeve. I don’t like business cards where the edge, I like the black business cards, but I don’t like the business card where the edge is white. I find it’s just aesthetically not nice. So, imagine a black business card. Front and back is black and on the edge and top and corners in the bottom, it’s white and then after when you give it to somebody and you keep it in their pocket and you put the keys in that pocket then it starts getting chipped away. So, I wanted first black paper. So, I started sourcing out the best black paper in the world. It brought me to a company in Italy then I said, “I want when they touch it they get another experience.” So, it’s actually a velvet finish so when you’re touching it, it’s very soft. In your hands, it feels rich. So, right now the detail of noticing black, nobody is saying, “Hey, look, the edges are black.” No one is saying that, but they just feel it. They feel there’s something special about my card then they touch it, yes, very clean front and back. The cards, they end up probably being $1 apiece which is in this industry is not, you’re thinking 10,000 cards, it goes up but every single one, every single person I gave it to regardless of they’re a paper expert or not, they appreciated, they felt it right away, they felt it was a different card, just the subtle details. Be the guy who knows a guy. Everybody is like, “Hey, I know a guy. I know a guy.” I bounced off ideas to close friends to one Greek friend, Stavros Papadopoulos. He says, “You know what, everybody says, ‘I know a guy,’ and you should put that in with your cards.” He said that idea and I love it. I love it. So, that created very clean, simple two cards pocket was born. [00:32:35] Brad: I like the fact that it’s two as well because you can give one to a friend and keep one for yourself. Was that the intention? [00:32:42] Pellegrino: Yeah. That was the intention. Three is you’re being too sales-like. You’re being that too pushy. One, after you don’t have a card, some people don’t want to even give their card because that’s the only card they have of mine. So, the two was a perfect balance. [00:32:59] Brad: I deal with a lot of people that pay attention to detail because it’s their business in financial services as well. I don’t know that I’ve met a person that pays more attention to the detail than you do. All the little things, it’s all the little things, right? Okay. We got to bust this out. [00:33:16] Brad: So, Dale Carnegie wrote a book called How to Win Friends and Influence People which is one of my favorites, but he also wrote the book called How to Develop Self-Confidence and Influence People by Public Speaking and my wife got this for me many, many years ago and there’s a section in here. I’m just going to paraphrase a couple of things, but it speaks to what you do, and I think the artistic way that you approach your craft and it’s really interesting. So, how you’re affected by clothes and the inquiry was sent to a large group of people by psychologists and university president asking them the impression clothes made on them. All but unanimously they testified that when they were well groomed and faultlessly and immaculately attired, the knowledge of it, the feeling of it have the effect which while it was difficult to explain was still very definite, very real. It gave them more confidence, brought them increased faith in themselves, heightened their self-respect. They declared that when they have the look of success, they found it easier to think success, to achieve success, such as the effect of clothes on the wearer himself. And then he gets into a little bit of how it affects the audience but I’m not going to redo the whole book on the show but let’s get to we’ve talked a lot about external how dressing impact somebody. Let’s talk about internally and your confidence in your approach. So, what are your thoughts around that? [00:34:37] Pellegrino: Well, that’s a great question and it’s a great observation that you made and also a great quote because all my clients their superpower or their help, their help to aid their superpower comes from feeling that confidence and that confidence could be applied on with Superman when he wears his cape, Batman when he wears his black suit, anybody when they put in their outfit and also us men when we put on a suit that makes us feel confident. There is still no uniform to this date for a man to where that has the prestige of a blazer. There’s still nothing. Either president or if you are a businessman when you put on a blazer, there’s a structure. It’s almost militarial. There’s a structure to the shoulders, there’s a structure to man’s outfit that the others reflect. However you feel inside, you feel confident. You feel strong. When you’re dealing with certain fabrics, when you’re dealing with certain fits, it automatically makes you feel confident. And, yes, they walk into the board meeting, it happens in a split of a second. They walk into the board meeting. Everybody looking at them a little more curious, a little more curious, “Who is this guy? He looks different from the other guys,” and you feel that walking to the board meeting. You feel that when you’re walking beside somebody and another colleague and he’s not wearing the same garment, or he doesn’t have the details put together like you have and you meet somebody, and that person is giving a few more attention than the other person regardless of how well-spoken or who he is. There is that confidence, that detail that radiates outside of you. It’s going to come out guaranteed and every one of my clients they feel that. [00:36:38] Pellegrino: Still to this day, it’s very hard to explain why, they express why, but when you are well, if you’re in your zone and well made-up clothes or you have your look put together as you want it to be and you know it’s another level and once you increase like I told you about where the sleeves should end and how the jackets should fit, once you increase your knowledge of that, you will pick up the guy beside you who doesn’t have that and it will come across, across the table. So, every one of my guys feels the exact same way as Dale Carnegie quoted over there and they come in with confidence, they come in with more security, and everybody else feels that. [00:37:22] Brad: Hey, Blueprint listeners, I have a special opportunity for you this week. I mean, I wouldn’t interrupt the middle of an interview otherwise. We are hosting for the first time ever at AE Headquarters an event unlike any other that’s taking place May 30 through June 1. It’s completely focused on how you as a financial advisor can make the leap from traditional old-school marketing to the new digital frontier. We’re going to focus on how to break away from old-school tactics and learn what’s working for some of our top clients from across the country when it comes to new strategies on Facebook that are driving prospects to your events, and even better, it doesn’t require you to pay for dinner. Here’s a bit of what we’ll cover at the event. First, we’ll have the actual Facebook marketing expert who helped run Trump’s Facebook marketing campaign during the election. I might add this isn’t a political conversation where he’ll be discussing right or left, just doing a deep dive into the tactical strategies that drove results for the campaign. Next, we’re going to have a digital marketing firm that is consistently filling our client’s events with 40 plus prospects per evening. What’s incredible is they’ve only missed this number four times in over 400 plus campaigns in the last three years and all attendees are being invited directly from Facebook ads with an online registration process to attend an educational event with no dinner being served. No direct mail whatsoever being used. They’ll show you exactly how they are doing it including something on Facebook called a look-alike audience which is a tool you can utilize to literally clone your top clients. More on that and how they do it at the event. Then of course, once you get a qualified attendee to actually show up, it becomes about the automated follow-up process you have in place to get them from your event to your office and then once they get to your office to becoming a client. We’ll have an Infusionsoft expert in to share exact campaigns working today in financial services. And by the way, if you aren’t familiar with Infusionsoft, you should be as it is changing the game for our clients. [00:39:23] Brad: Lastly, we’ll have two of our top performing offices which gathered 233 million and 97 million organically in 2017. They’re going to share their real-world marketing ROIs, how they consistently keep the calendar full, and the key to scaling your firm, so you’re no longer a salesperson or an asset manager that has to show up to work each day but rather a CEO. So, if you’d like to see if you qualify to attend, it’s as simple as taking five minutes to fill out a short application online at BradleyJohnson.com/TheCatalyst so we can understand more about your business and make sure that the event best fits you. And for those that qualify, we’ll fully cover your cost to attend including your flight, your hotel, and your ticket to the event. And if you play your cards right, maybe we’ll even crack a bottle of wine or two at my house. You never know. With that being said, this is the first time we’ve ever done an event fully focused on digital marketing, so I promise you it’s going to fill up fast. I’ve actually already seen a few registrations coming in. So, go fill up the application at BradleyJohnson/TheCatalyst to save your spot today and I’m going to be looking forward to the chance to meet a few of you face-to-face. [00:41:09] Brad: Which you just reminded me off when I played football in college. To go on to the field and wear the uniform, it was everything had to be like the shoes had to be spatted up a certain way. It’s like I’m ready to go out and perform and the way I look at that in business is this is the closest thing you’ve got. Are you ready to dress for success so you’re ready to go out there and perform? And there’s so much psychology that goes into that, but I think you’re spot on there. [00:41:35] Pellegrino: Definitely. And how much of, for example, how much of you does a client really see? It’s just your face and your hand. That’s it. That is granted. The rest is made up. The rest is a story. The rest is communicating to the other person who I am, what I stand for, what I believe in, what status I am at this point in my life. That’s a communication you’re constantly speaking to the other person in front of you and you knowing that you built confidence. [00:42:07] Brad: Awesome stuff, man. I feel like I need to buy more suits from you after this conversation. [00:42:12] Pellegrino: We have a line. You think that’s a huge order. Get in line. [00:42:18] Brad: Cool. Let’s keep rolling. Okay. So, one thing we talked about before we went live here you said if there’s one thing that I can do, obviously not everybody’s going to be on Montréal in your own backyard where they can come up and see you. If I’m a financial advisor out there, I’m going to give them some tips that if they’re looking at doing some custom suits in their local market, here are some things to look for in a tailor so you know you’re working with a good guy. [00:42:42] Pellegrino: Yeah. Okay. So, there are three things you got to remember when you’re looking for your tailor. So, wherever you are around the world if you’re searching for the right tailor and you’re questioning, you don’t want to go to that old Italian guy at the corner and you see his windows like just three shirts for $9.99. If you’re questioning what is a good tailor from a bad tailor, there are three things you have to look at. One is fabric, second is a fit, and the third is a making of the garment. So, I’m going to break down these three and that’s it you have to work with. So, these three you have to keep in mind when you’re meeting or interviewing a tailor. Better you call it interviewing because he’s going to be selling through you. You have to interview him with those three questions. So, you can jot them down or you can review it back on this podcast. So, what the three things are? Let’s talk about versions of fit. If I ask you a question, would you take a suit that will last you only six months, but the fit is beautiful on you? Your wife turns around and says, “Wow. You look so good. The fit is gorgeous. Would you take a suit that will last you only six months or another suit that is baggy, loose, doesn’t fit as you well but the guy at the store tells you, “This will last you ten years?” So, majority of men will take the one that fits them well regardless of how long it lasts. So, the fit, in reality, has a lot to do with if you’ll be happier or not at the end of this process. So, how can you tell this tailor will give you the fit you like? You have to ask for their pictures. You either have to be referred. You have to ask him, “Have you tailored any important people or people I could see on the media or on the internet?” Fourth, look at his suit, look at his back when he turns around and when he goes get you an espresso or something, look at him. Look at his pants. Is that the style that you want? [00:44:41] Pellegrino: Maybe it’s an older tailor. Maybe he has a different style. Look at the mannequins. The mannequins are hard, to be honest. The mannequins are hard to tell because there’s a lot of pins and needles. You have to see some of his results, so the fit is probably that is one of the most important parts. Second, I don’t think every tailor could give you the fit you need because the tailors are trained to sew. They’re not trained to do fittings. The fittings in the fashion term is called draping. I spent the next three years learning how to drape properly then the seven years making a lot of mistakes in a lot of people fitting them properly in the span of ten years and I have given the skill of actually sewing to my tailors. I know how to do it in principle but I’m not nearly as qualified as they are. So, everyone has their skill. So, a lot of times people think, “If he’s a tailor, he knows how to fit,” and it’s the biggest misconception. They do not. So, the fit is you walk in, you look at these telltale signs to know if they can make their jacket that higher arm roll, tapered sleeve, more flattering down the leg then it stops at a certain level. Second thing that you want to look at is the fabric. Where is he getting his fabric from? Now, there’s a lot of gimmicks from China. China is replacing a lot. China, India, Bulgaria, they’re replacing a lot of the Italian fabrics, lookalikes with a knockoff version. So, the dealer he has to be dealing with these brands already. So, I’m going to tell you the four top brands which is Zegna, Dormeuil, Scabal, and Holland & Sherry. Now, there are other brands out there that will make a fine cloth, but these are the top. If you deal with one of these, you can sleep well at night. You’re getting a good quality fabric. There’s a lot of other brands which you have to question. [00:46:40] Pellegrino: It doesn’t mean they’re bad, but Barry’s is beautiful, Cerruti is beautiful but you have to see what cloth you’re getting from them. However, these are the top brands. You have to look at those books, write them down, research them, the top brands. You make sure he has those books inside the tailoring shop. If he doesn’t have those books inside a tailoring shop, it tells you something about this tailor and these fabric suppliers don’t believe in him. So, I received – I’m one of 50 in all of North America I received a Diamond Chip from Scabal. His book is sold exclusive. There are Diamond fragments in this suit. The suit cost over $15,000 just one suit. The Scabal make sure that the company that produces this fabric, make sure that do I make a proper fit? Does the tailor do a proper work? Does he have a good reputation? So, you could tell by the fabric books he has that he’s offering if he’s a good dealer already. So, look at the fabrics, those names that I mentioned, look if they have those books in their shop so that’s a second sign. And the third one is quality in the making. They will all generally do a good quality suit and they will stand behind their quality. If something opens up, they will fix it. It’s all handmade so you have to take a look at, but you have to just open up the jacket, make sure that it’s all hand done on the inside that the seams are right. Look at the pockets. The pockets will tell you all the signs. Look at the little details of the inside of the pants. Those are the little things. So, those are the three things. Quality of making, fabric, and fit to look for in a tailor. [00:48:31] Brad: You hit on it. You have to tell the story. I’m going to stand up again. Tell them what this is right here the interior of the jacket. [00:48:38] Pellegrino: Okay. That’s silk. Those silks come from women’s dresses and I was looking to put silks inside my jackets for some time and I don’t know if you can see that. Okay. On mine too. And I started dealing with old manufacturers and say to them, “Can we get some beautiful silks that go into men’s jackets?” And they said yes. So, they shipped me some silks and they’re just boring colors, plain boring colors, and I said that, “You know, when you know that there’s something else out there, but you’re just not convinced of what’s being presented to you?” So, I have that feeling. I was coming back from Rome back to Montréal and there was a lady sitting beside me who had a beautiful silk skirt. I said, “That’s the type of silk I need in my jackets,” and you can just feel the way it draped on top of the leg, the way it just shines off the light, you see the quality, the design. The designers who designed that silk put thought into it, color into it. So, I said, “That’s it. Let me look at women’s dresses, silk that is made for women’s dresses.” So, I found a supplier in Italy that manufacturers Dolce Gabbana, Versace, Armani, all the women’s dresses and I asked them, “Let me purchase the end of stocks. So, after you finish in production, let me purchase all your ends of stocks and ship them to me,” and actually that’s what’s going inside of my men’s suit jackets is women’s silk for dresses which their wives go crazy. [00:50:11] Brad: I didn’t know that I would ever be comfortable wearing a women’s dress, but I do… The personality in your suits is incredible because they all have a personality to them and it’s just the way you’ve thought through every little thing. I just can’t say highly enough how much I admire that. [00:50:30] Pellegrino: Awesome. Thank you. [00:50:32] Brad: Since we hit on Italy and this is a selfish question so sorry if you advisors out there were taking this a little different direction. Number one, so I’m taking my family to Italy this summer so we’re going, the whole crew. We’re going to take my wife’s mom who’s a lifelong Catholic. We’re going to go see the Vatican so it’s kind of one of those bucket list trips for her. [00:50:52] Brad: And every single person I’ve ever told up to this point to, “Hey, we’re going to Italy,” like, “That’s my favorite place in the world,” and these are people that have traveled all over the world like to all of these countries. So, I know you go back and forth there a number of times a year. What’s the one thing on an Italy trip that we need to experience? And maybe if that relates to what you do as a profession in some of the different cool little areas you’ve seen that are off the beaten path, please share. I’d love to hear it. [00:51:19] Pellegrino: Yeah. Everybody goes in like every other country with an itinerary. You have to allow some time to do nothing, the sweetness of doing nothing, of being in the moment. So, in Italy, you don’t have coffee to go. You go to a bar, you ask for coffee, you sip it there. You take the moment, you enjoy the people around you, you enjoy the noise, you look at a person beside you, you engage in a small conversation. The person at the bar who’s serving you the coffee, he talks to you for a couple of sentences, where you’re from. Those moments is why people keep on going back. Scenery, there’s beautiful sceneries all across the world but Italy doesn’t do take away coffee because they understand that they have to have these breaks where they engage with people. It’s in our blood. You need to engage with people. You need to have a moment where everything else is forgotten and the person beside you is the only person existing. So, my biggest advice is to anybody going to Italy, enjoy these little moments because the Italian’s culture, my wife and I would go there two to three months a year, the Italian culture they don’t want to. They need to speak to people. It’s a desire. They need to engage in a conversation or else they’re going to explode, and you being there, enjoy that process, enjoy the moment. If you’re going to be late to the next thing on your list, it doesn’t matter. Just take that moment, enjoy that scenery, enjoy that moment. And no matter where you go, every day you always have a couple of places where you can just take a step back and enjoy that moment. That would be my biggest takeaway for anybody going to Italy. Engage in conversations and enjoy certain moments of the day where nothing else exists. [00:53:16] Brad: Such a beautiful answer. And I know I just sprung that on you, so I love just the, “Hey, don’t have to-go coffee in Italy.” That kind of sums it up right there. It’s all about experience and being in the moment and I hear, by the way, they absolutely love kids over there. Like they’ll like steal your kid and run in the other room but don’t worry about that, they’ll bring them back. Is that true? [00:53:34] Pellegrino: Yeah. Exactly. So, I have a daughter. She’s five-and-a-half years old. Over here in North America when somebody touches your child, you question like, “Hey, where are you going touching my child?” They touch the head or pinches the cheeks but over there they do it so naturally, you feel like it’s your aunt coming to say hi to your child. My child passes in front of somebody and the person just walking, “Oh, cute,” and just touches her head. They’re so in tuned and they understand the importance of children. They don’t view them as annoying. They’re screaming and crying, they actually laugh. They laugh at you. They say, “Hey, I’ve been through that.” So, they love children. It’s not all to be concerned. They don’t frown. They think it’s natural and normal. [00:54:24] Brad: Good. Because we’ll be bringing three that are pretty action-packed over so that’s good to hear. [00:54:31] Pellegrino: They’re going to love it. [00:54:32] Brad: Good. Good. Okay. My friend, I’ve got to get to some of these philosophical questions after that last answer. I mean we got to keep going there. All right. Let’s go with this one. When you hear the word successful, who’s the first person that you think of and why? [00:54:48] Pellegrino: Okay. There’s one lady that’s coming to my mind. I’m sure there’s a lot more. I’m going to have to say this old lady she’s about 85 years old from Tuscany. She took her old house and made it into a bed and breakfast and she wakes up every morning and she makes lunches and breakfasts for everybody out of her own joy, out of her own passion. I say she’s successful because I very rarely see people so excited into whatever they’re doing, their work. They’re like, “This is why I’m put on this planet.” Very rarely I see that. There’s a lot of people I’ve seen them have that, not a lot of people. A few but her it’s coming to my mind where when you say thank you to her, it goes on deaf ears because in her head she’s saying, “Thank you to you for allowing me to put out the spread and enjoy this bed and breakfast in the Tuscan hills of my villa and I could be around people.” So, I really believe – I look at people who are so happy of where they are in their life. I don’t know if that’s the answer you’re looking for. [00:56:03] Brad: I’m looking for whatever answer comes to your mind and that was awesome. [00:56:06] Pellegrino: I like people who are happy of living where they are in their moments of their life regardless what they’re doing. [00:56:12] Brad: Yeah. Is she close to Florence by chance? [00:56:16] Pellegrino: Yeah. Very close, about an hour away. [00:56:19] Brad: Offline we need to, it sounds like that’s a bed and breakfast we need to check out. Cool. All right. Here’s one of my favorites lately. Okay. So, what is something that you would like to see considered absurd 25 years from now? Or put another way, 25 years from now we look back and we’re like, “Can you believe they used to do that?” What comes to mind for you? [00:56:45] Pellegrino: First thing coming to my mind is driving. I know it’s happening so it’s not too far fetched but having nobody drive anymore just like transport, full safety. Nobody’s getting to car accidents, nobody’s texting and driving, no other problems. So, I would love to see not one car on the road that somebody, that a human is behind it. I would love to see just fully automated everything. [00:57:12] Brad: I’m with you. Are you a Tesla guy by chance? Are you autopilot? [00:57:16] Pellegrino: No. I’m not yet. I don’t buy but a lot of my clients are. I’m old school gas. [00:57:31] Brad: That really rings home with me, Pellegrino, because I mean we’ve got kids the same age and it just scares me especially like at least when we were kids you didn’t have mobile homes in people’s faces and now that’s just scary stuff. So, I’m on board with that as quick as we can get there. [00:57:47] Pellegrino: Yeah. It’s coming. [00:57:49] Brad: Well, you’ve got a lot of tech buddies. I’m sure they’re giving you all the insight too. [00:57:53] Pellegrino: Yes. So, Most of my clients, a lot of my clients are in the tech world. [00:57:57] Brad: Yeah. Which quick shout out, we have to give Daryl a shout out being a fellow masterminder. He was at the F1 party and hosted us well so hey to Daryl if you’re listening in. [00:58:07] Pellegrino: One of the most knowledgeable persons I have ever met in across this thing and dealing with banks for credit card conversions. [00:58:16] Brad: Yeah. He’s done okay for himself in that space I think. [00:58:19] Brad: Is there a book or I’m going to expand this question a little bit for you. Is there a book or maybe a piece of art because as I listen and try to be present in this conversation the whole way through I really love how you view a suit jacket? It’s your form of a piece of art. So, is there a book, is there a piece of art, is there a piece of music that’s influenced you over the years? [00:58:43] Pellegrino: A lot of art influences me and the art that triggers negative emotions in me are the most fascinating art pieces, things that I have to contemplate, and I wonder. So, anything that triggers those emotions, I do enjoy from random artists. But if you are going to the Vatican, there is from Donatello, his painting it’s all about dark and light. Anything that has strong contrast of dark and light inside the painting is probably one of my – it’s in the Vatican. You’ll see this as you go into the first section. It’s one of my favorites. And just a story behind it. It’s not just art. We’re all about stories, right? I want to know as many stories about you. You want to know as many stories about me. When we get together with our best friends, we tell stories. Our life at the end of it, we just want these stories to the next generation. And it’s the first time in history in all of history since the beginning of mankind, we are documented. First time. Your child, how many videos you have of him since he was born, and pictures? And it will keep on going. We document our children their whole life. Back, myself, I probably have like maybe five videos when I was a kid on an old camcorder and going back to my father or my mother I’m lucky if I have a picture. However, this generation is first time it’s all documented. The amount of stories that we are accustomed to because that’s the only way of knowing who our parents were and our grandfather, there was no video of them, so we just have to repeat these stories. It’s ingrained to our generation. We need stories to connect, to understand. [01:00:37] Pellegrino: So, anything that is given as a story along with the art, the thought process, any idea or why, I will respect it and I will appreciate it. I don’t love it, but I would enjoy listening to that story and enjoying my time being exposed to this art, this piece of art. I believe strongly there’s a story that has to go along with it. [01:01:07] Brad: Well, you bring up something I wanted to add into the conversation. We’ll put a link to your I think it’s PellegrinoCastronovobio.com because that’s the one thing, couple of episodes ago I had a guy named Chris Smith on and it was a super popular episode but actually I think he’s going to come to MastermindTalks if you’re going to be there again this year. He calls it creating your origin story in your business and I was watching your bios, where there are little videos, there little like two-minute videos, and you say, “Here’s who I am. Here’s why I do what I do. Here’s how I do what I do but here’s like,” you even go back to a story from when you’re a little kid and how you kind of saw the world and when I watched it I was like, “Man, that’s like Chris Smith Campfire Effect. That’s Pellegrino’s origin story right there.” So, we’re going to put a link to that in the show notes because I think there’s so much financial advisors can learn from that because you’re real, you’re genuine, you’re like, “This is who I was,” which I’m guessing like as a little boy being a guy that was really into art, that probably wasn’t the norm. You are just fitting into the crowd there, but it made you who you are today and why you’re so good at what you do today. So, we’re going to leave that in. [01:02:17] Brad: Okay, my friend. As much as I’d like to keep this rolling all day long because I feel like this is you and me. We should have a glass of red wine in front of us or something. [01:02:26] Pellegrino: That sounds good. [01:02:27] Brad: But last question. As far as sharing with the audience here, if you could really define it down to one thing, what’s the one thing that’s led to your success to this point? [01:02:38] Pellegrino: It would have to be giving people what I want. That’s it. I’m constantly being in tuned of what I want in my life and I’m giving it to people. I’m believing that other people want the same thing. Yeah. Just being in tuned, being in tuned and reflecting that. I believe everybody feels the same deep down. We have a lot of common feelings. So, when you’re in tuned to your feelings instead of just worrying about what others are thinking of you when you just turn the mirror on yourself and just be, “What am I feeling at this moment?” I believe strongly that that is what I projected to other people when I deal with everybody and I think what I want the suit for myself and I just didn’t put up with somebody saying, “Hey, this is the best silk. You deal with it. This is what we got.” No. It’s like I don’t want that first of all. I don’t want to wear that. I want to wear something better. I want a story behind it. I want to feel great about myself. I want to feel the romance in myself too, but I don’t want to hide it when no one’s watching. [01:04:10] Brad: Yeah. Please do. [01:04:11] Pellegrino: I would honestly say when I’m looking for a financial advisor or when I look for my financial advisor I look for the story. Who is he? When I walk into the office, does he have pictures of his kids behind him? And I know it’s nothing professional and I know I talked to other financial advisors and they feel a little bit intimidated or they don’t want exposed, but I look for these things to know that, “Oh, he has a family so, therefore, he’s not going to run off.” He has a hobby. Look at his hobby. It’s behind him. He has the samurai swords behind him or he has this aquatic fish tank of salt water or he likes watches, I mean, like his hobby but I know that he is a person that has interests and I can relate to him. I need to relate to my financial advisor because a lot too often they’re very generic and they’re trying to copy the guy beside them. And they’re always coming in as a cross between a banker and somebody who is a car salesman or just a weird crossing between where I constantly feel like who are you? Who are you like when I sit in their office in their chair, from the moment it’s in their chair, this chair is provided by the bank? Where did you pick this chair up? What’s this table in front of me? What’s on the table? Are you trying to impress me by just your mouth? What story you have around you? Where can I connect with you? And I feel that connection, that building of rapport from the connection of who the person is, who’s going to be taking my finances, I feel that is the missing, a huge missing link in many financial advisors. They want to keep it too professional and cold and that was great in my grandfather’s times. [01:06:10] Pellegrino: But right now, there are so many on the market, we’re looking at who, what character, what person would be the best for this, for what I need them to do. And there are trips to Morocco. There are trips to here and there. Have a little picture. If I know there’s pictures in the person’s office, I know he’s not running away tomorrow and I know the company appreciates him there because there’s a lot of institutions where the company, we know that the company will probably kick this guy out or if he gets a better job, he’s jumping over to another company or another institution. But when I see him nesting, settling in with these little details and him getting permission if he would say from a company to put up pictures and this, I feel okay. No, no, no, the company and him are in line to stay there. It’s for the long shot and this is where I build trust and I want to invest into a person like that. Because at the end of the day, you’re investing to the establishment but you’re investing also to the person in front of you. You’re investing that everything he’s saying at the end of it is true. So, once you have all that story that you’re providing, those details, that trust, then what the person is saying goes in. You’re not questioning behind, it goes in perfectly, and you feel confident to move forward. [01:07:38] Brad: So, why did you save that until the very end? That was so much knowledge you just dropped right there. I’m glad you kept it going there. We got so much. What I love that you just expressed right there is it’s all of the stuff that’s going in through people’s heads as they’re sitting across from their financial advisor that most financial advisors are completely blind to. And it’s just we’re in an industry like you said of two things like they’ve always been done, copy the guy next to me or the gal that mentored me or whatever and, man, so spot on so thank you for sharing that. [01:08:11] Pellegrino: And just to tell you about your character too. There was another point, we were in the bar, we were having a good time, we’re talking, we’re after the sailboat and you told the bartender, “I’ll pick the top for the whole bar,” but there was two people sitting at the ends of the bar who wasn’t part of our sailboat. They’re just a couple sitting there by themselves and a lot of people would’ve been, “You know what, no, no, this is our group. This over here I’ll cover the tab,” but you said, “Yeah. Throw them in too,” and you started engaging into conversation with those two people and they actually cheered you on and they said great things and very pleasant and thank you very much, but you can’t fake that. When you see a character like what you just did over there, I know it wasn’t intentional and you engage in their conversation and you made their day, you come from a good background. You come from a background where your parents are like they treat others as you want to be treated, respect the people around you if you could let out. If you could be nice just for the sake of being nice, do it. Those are telltale signs. People are feeling. They’re not thinking straight out. They’re just feeling and I never thought about that moment until just right now but it’s stuff that the little details that they’re so not engaged what the other person is thinking that you have time to just kind of allow spontaneity to happen and to show your real character in that space. So, like that, it allows conversations to go organic and to not go buy the book. If there’s a picture of you in the background with your kids in a mud pit, what is that about? This guy is unafraid to put that? Why did you get? [01:10:10] Pellegrino: “Well, it was raining one day when I was taking my kid and it was just the best moment.” It allows a conversation to go outside the book where people can build that confidence because when you go script, they know you said that line a thousand times. They know there’s no way out of it. They feel stuck in there, so they need to go outside, and you have help them too to go outside of their comfort zone, so they could feel comfortable to engage that spontaneous conversation, so they can build that trust, get to know who you are, and know that this is not scripted and then you could bring them back into whatever financial or whatever you’re offering. [01:10:48] Brad: Pellegrino, my friend, if this suit making stuff doesn’t work out for you, I think you’ve got a future as a financial advisor coach. That was like wisdom bomb after wisdom bomb you just drop there like the last 10 minutes. So, well my friend, man, this has been fun and thank you so much. I’m so grateful to call you a friend and my wardrobe has – my wife loves me more now because of you. [01:11:14] Pellegrino: That’s what I want to hear. That’s what I want to hear, man. [01:11:18] Brad: So, it’s been a pleasure. Thank you so much. Thanks for sharing with the audience here. It’s been a lot of fun. [01:11:23] Pellegrino: Thank you. Thanks for having me on. [01:11:25] Brad: All right, my friend. Until next time. [01:11:31] Brad: Thanks for checking out the latest show. I really appreciate the couple of minutes you all have taken to share your thoughts as the reviews help our show get found and rank on iTunes and really your feedback is what fuels me to keep the amazing guests coming and keep these episodes getting cranked out one by one. Also, special thanks to those of you who left a review since our last show as we are now in the triple digits with 106 reviews. Thank you, thank you, thank you. Thanks for the review and I love that you found the podcast early on in your career as it’s my goal to condense years’ worth of knowledge into each episode by bringing some incredible guests on and asking them questions I know financial advisors are wondering about based on my decade plus of conversations with them. So, I was trading LinkedIn messages with a college student who reached out to me the other day saying, “Thanks for the mentorship,” and it really hit home to me that with today’s technology, there really is no barrier to seeking out wisdom. It’s about who makes the time to go out and get it, so well done on your end, keep it up, and the extra effort will pay huge dividends in your practice, that’s a promise! [01:13:30] Brad: Thorn, thanks for the kind words and it was great to connect with you in person as well, so thanks for reaching out and applying to have a chat! Also, I love the fact that you’re not just focusing on the business side but running with the family board meetings that Jim Sheil shared a few episodes back. It’s been the #1 most powerful thing I’ve done as a dad to connect with each of my children in a way that’s completely unique to them so well done! For those of you wanting to connect one-on-one like Thorn did for coaching or maybe you’re interested in attending one of our events at AE Headquarters, you can apply in under 5 minutes at BradleyJohnson.com/apply. First off, phillipmills, I want to thank you for serving our country as without you and others like you, none of us would be able to do what we do. And if you just so happen to be listening to this, please reach out personally as well as one of my good friends Phil Randazzo happens to run a nonprofit named American Dream U whose sole purpose is to help veterans transition from serving to getting back into the workforce and he’s actually partnered with us in Advisors Excel to get more veterans into financial services, so if you need any help with the transition, we’re here for you. Secondarily, thanks so much for the kind words and review. Chris Smith’s episode was one of my favorites and it means a lot to me personally that the podcast is helping you make the transition and I will do the very best to keep putting out content that can serve others like you! Thanks for the review and for listening in, David! Also, thanks for trusting us and making the transition to being part of the Advisors Excel family of advisors all across the nation. We’re glad to have you on the team and helping you grow your practice in a way that serves your clients up there in Omaha. As they say, better late than never right!?! Also, look forward to meeting you in person at an upcoming event. It’s always cool to see how the world of podcasting and virtual can translate to real world and the opportunity to work with people that you connect with and are like-minded with and just it still continues to blow my mind. So, thanks for reaching out, David, and thanks for the review. [01:17:07] Brad: So, if you’d like to apply to see if it makes sense to have a one-on-one conversation with us, you can do that at BradleyJohnson.com/apply. It takes about 5 minutes to fill out the application, so we can understand what your business looks like, what challenges you may be facing and how myself and my team may be able to help. We then dive into what we call a Discovery session where we ask a lot of questions based on your survey, we do a lot of listening, and we take a lot of notes to build a rough draft of our proprietary 90 Day Plan™. Taking the first step is as simple as applying at Bradley johnson.com/apply! This is provided for informational purposes only. Producers are ultimately responsible for the use or implementation of these concepts and should be aware of any and all applicable compliance requirements. Results from the use of these concepts are no guarantee of your future success. Please be aware of and abide by any and all applicable gifting limitations. AE04184053 This information is intended for financial professionals, it is provided for informational purposes only.